NASA International Space Apps Challenge: Kathmandu Hackathon,a 48-hour event organized by YoungInnovations and ICIMOD within the framework of the SERVIR-Himalaya Initiative supported by USAID and NASA, called on youth participants to embrace collaborative problem solving to produce open-source solutions to global challenges. 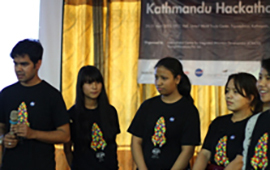 From 20 to 21 April, young, innovative software developers, engineers, designers, and technologists from Kathmandu came together at the event to develop solutions to pressing global problems. The top three teams were announced at the closing ceremony on Sunday and awarded cash prizes of NPR 30,000, 20,000, and 10,000. The winning team Mars Odyssey, consisting of Binayak Dhakal, Roshan Bhatta, and Sakar Pudasaini, developed an easy-to-use tool to teach children programattic thinking without the need for technical programming knowledge. Team Phoenix – Arun Aryal, Deepak Pradhan, Roshan Batta, and Anil Karki – were awarded first runner-up for their all-terrain rover, which showcased the ability of the Mars Rover Curiosity to explore and assist in human research in space. 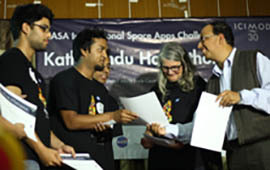 Likewise, in third place, team Deep Space 2, made up of Rabindra Kharel and his partner Deerghayu Shrestha, developed a method to detect and visualize anomalies in spatiotemporal data that could eventually be used to detect hazards and enable faster visualization of the region’s climatic conditions. 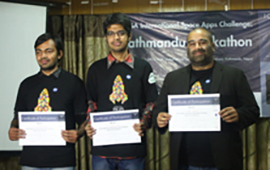 The Kathmandu Hackathon was a part of the larger NASA International Space Apps Challenge, with similar events being held at the same time in cities on all seven continents. Together, ICIMOD and YoungInnovations will now submit the top two solutions to NASA for global judging and awards, which will be decided solely by NASA.